Bhiksuni Liao Yi is the CEO, Chief Executive Officer, of the Museum of World Religions (MWR) in Taiwan . The Master, upon receiving her Bachelor's degree, determined to devote her life to work with Bhiksu Hsin Tao for World Peace via religion. 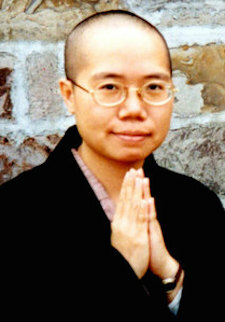 For 10 years she meditated and engaged in Buddhist studies. Then for ten more years, Bhiksuni Master Shih Liao Yi engaged in interfaith exchange in order to build the Museum of World Religions . It is the only museum in the world which hosts different, major religions of the world under the same roof. The mission is: "Respect for all Faiths, Tolerance for all Cultures and Love for all Life." She conducted a long-standing research project about sacred sites in Bosnia , and organized an international conference on "The Global Preservation of Sacred Sites." Bhiksuni Liao Yi also fund-raised for the rebuilding of the Bamyan Buddha Statues in Afghanistan via the Coalition of the Provisional Authority of Afghanistan . Continuing her inter-faith peace work, she cooperated among different religions to establish the preparatory office for a University of World Religions . Both the MWR Research Center and Tri Yana Buddhist College have served as a platform for this new project. Bhiksuni Liao Yi also organizes Buddhist-Muslim Dialogues to promote peace and understanding. She believes that inter-faith work and Buddhism's compassion will lead to World Peace. She does not stand aloof from society and complain; she does not resist globalization. She chooses to implement the concept of a Global Family and co-existence with others in harmony.